Just who are these instrument-wielding miscreants, and what exactly do they want with you? Well, I assume they want your money, because their CD release show isn’t free. But these dudes are smart enough that they could’ve become Wall Street hoodwinkers or dot-com gillionaires if dough were their priority. Maybe they want you Portlandians to start dressing more snazzily? Or are they modeling poses for a new series of those real-life-sized bronze statues downtown? Maybe they just wanna bombard you with music so inviting, intricate, and infectious it smacks the summer ennui right out of you. 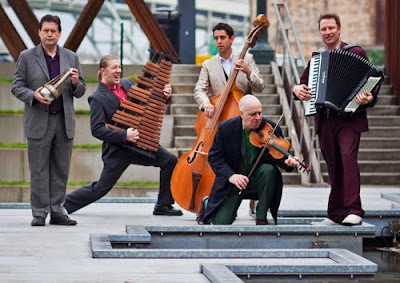 Their genre, alas, is called “world chamber music,” and it’s woefully insufficient to describe the exhilarating brilliance and sly sense of humor employed by the five members of 3 Leg. You’ll recognize influences and traditions from indie pop to classical, klezmer to jazz, and experimental to rollicking cabaret. The new disc, “Animals & Cannibals” reveals new instrumentation for the band (is that a waterphone in Gary Irvine’s hands, above right?) and wanders through some new, highly textured territories not explored on previous releases. Celebrate the release July 31 at Alberta Rose Theatre. All ages, tickets $15-17 ($25 includes CD). Doors 7 pm, show at 8. Full disclosure: OK, I’ve played with some of these sartorially besuited gents in the past. I can still be objective enough to say they’re freakin’ great regardless. to answer a question i just got in email: i don't actually *know* whether that's some sort of mini waterphone. i was guessing! Thanks for the kind words! And yes, it is indeed a waterphone that Gary is wielding. The instrument is most recognizable at the end of the song "Frog…Secret Agent" on 3LT's last release, Astor in Paris.